Spend at least as much time reading as you do writing. Make sure you know how to spell, use words correctly, and punctuate properly. If you are weak in any of these areas, do enlist a professional editor. Don’t rely totally on your spellchecker, because it will not alert you to properly spelled words that are used incorrectly (such as “your” for “you’re,” “to” for “too,” “there” for “their,” and so on). Leave no stone unturned when researching how to publish and market your book(s). If you don’t already have a website, build one. Join social networks, and follow other authors. And have fun! Writing should be a joy and a pleasure, not a chore. Be passionate about your chosen genre, and your passion will make you a better writer. Laura Pinto is a baby boomer who grew up in the Garden State, New Jersey, the setting for her first published novel, THE D.A.’s FOREVER. She loves reading, writing, and the music from rock and roll’s golden era. Laura is best known among oldies fans for her many websites, blogs, and social-network profiles reflecting this passion of hers; if you’re a fan of oldies music, chances you’ve visited at least one of her sites. They include Oldies Connection (which features, among other things, a birthday list, memorial pages, and literally thousands of links to the official sites and social network pages for artists from the 1950s, 1960s and 1970s), as well as artist-specific websites for Ron Dante of The Archies; Andy Kim; Joey Dee; Neil Sedaka; Robin McNamara (official site); The Dixie Cups (official site); and legendary Brill Building songwriter/producer Jeff Barry. Links to all these sites, as well as to Laura’s blogs and social network profiles, can be found on her homepage, laurapinto.com. 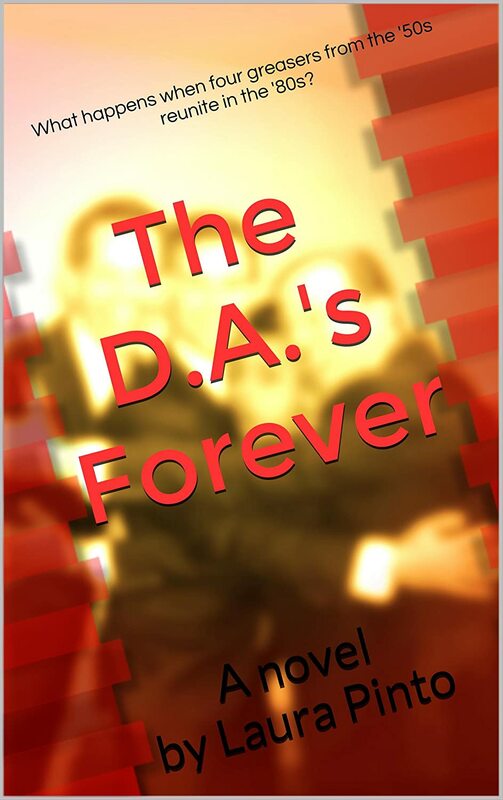 My love for the music and lifestyle of the 1950s, ’60s and ’70s was what inspired THE D.A.’s FOREVER, which I actually wrote in the mid-1980s and tweaked for publication in 2013. Although the novel takes place in 1988, THE D.A.’s FOREVER pays tribute to the greaser culture from three decades earlier, spotlighting four men in their late forties who are being dragged, kicking and screaming, into the modern era … and adulthood.